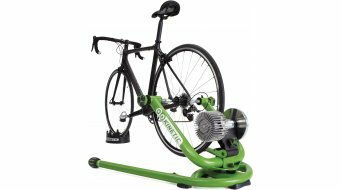 Cycle trainers enable you to perform indoor training with your own bike. They are reminiscent of the function of spinning bikes and ergometers. This way you can for example comfortably perform your training in the evenings in the living room while your favourate TV show is running in order to keep yourself fit in winter. Cycle trainers or bicycle rollers are mobile and can easily be transported, thus you'll regularly find them at racing events where they are used by athletes for warming up the muscles. Bicycle roller or cycle trainer? For novice cyclists, the bicycle roller might pose a challenge since you have to keep the balance with your bike "without any support" on three interconnected rollers while you are pedalling your bike. The bike is not fastened to the rollers, you actually ride it "freely", without support. It really takes a little practice. The benefits are clear, while doing it, the coordination and riding technics are also trained, therefore the entire training is more effective. Some of these bicycle rollers from Elite can be found here in our shop; Elite is one of the top manufacturers in this field. A classic cycle trainer takes up the rear wheel, which is fixed by means of a quick release skewer / lynchpin. The bike is held stationary. Depending on the type of trainer, lateral movements are also possible while dancing in the pedals - i.e. realistic training units standing on your bike. The Kinetic bike trainers for example make that possible. Other features also ensure an eventful training, realistic hill training (mountain rides) is possible as the steepness is simulated by the trainer by means of an increased roll resistance, riding against opponents is possible, or even the wireless transmission of training data to the PC in order to enable you to subsequently evaluate your training. The modern, internet based Bkool trainers even score with a 3-D-world. All the accessories for roller trainers, such as sweat catcher, protection mats for the floor, which also absorb and dampen the sound or also pedal frequency sensor or similar, are available. Also the training in combination with the appropriate bike trainer software is not unusual any more nowadays. Tacx and Elite for example offer numerous DVD training routes & tours, which you can master at home in a varied training session. Experience the routes of the Tour de France, the Amstel Gold Race or Paris, Belgium, Milan and many more with a virtual trainer! This way, the training will remain attractive, varied and your ambition is awakened. The connection with your training colleagues is also possible by means of software and via the internet, so that you can perform races and ride against each other in a group training. Discover our top selection of bicycle trainers, roller trainers, free rollers and virtual reality trainers here online in the shop for roller trainers. The top brands Elite, Tacx, Kinetic, Bkool and more await you. It also is not a matter of the purse since you'll find models for novice cyclists starting at 100 Euros as well as hi-tech models which cost around 2,000 Euros. No longer an excuse at bad weather conditions or in the winter months. Get up on the rollers, and off you go! Have fun indoor training on the bike!